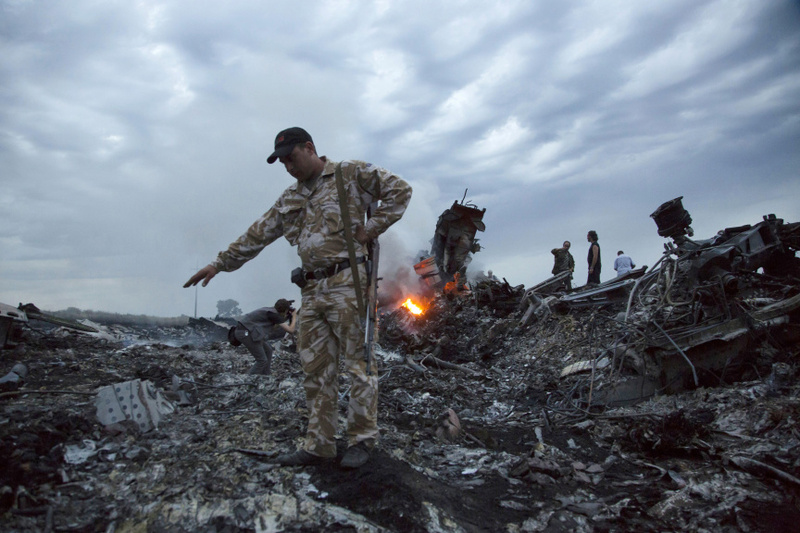 THE HAGUE, Netherlands (AP) — A day after international prosecutors said they had unequivocal evidence of Russian involvement in the downing of a Malaysian passenger jet over Ukraine nearly four years ago, the Netherlands and Australia on Friday announced they were holding Moscow legally responsible for its role in the missile attack. The move puts further strain on already tense relations between Russia and the West and opens a new legal front in the long-running process of apportioning blame for the July 17, 2014, missile strike that blew Malaysia Airlines Flight 17 out of the sky and killed all 298 people on board. "State responsibility comes into play when states fail to uphold provisions of international law and that's clearly the case," Dutch Prime Minister Mark Rutte told reporters in The Hague. On Thursday, a Dutch-led international team of investigators said they had strong evidence that the Buk missile system that brought down the Amsterdam-Kuala Lumpur flight came from a Russia-based military unit, the 53rd anti-aircraft missile brigade based in the Russian city of Kursk. It was the most explicit link yet published by the investigators between Moscow and the downing of the flight known as MH17. Rutte demanded that Moscow fully cooperate with the criminal probe. Australian Foreign Minister Julie Bishop called for international support for the Dutch-Australian legal initiative. "If military weapons can be deployed and then used to bring down civilian aircraft in what was essentially a war zone, then international security is at risk and we call on all countries to inform the Russian Federation that its conduct is unacceptable," she said. The two nations quickly got support from allies including the United States, Britain and the European Union. "It is time for Russia to acknowledge its role in the shooting down of MH17 and to cease its callous disinformation campaign," U.S. State Department spokeswoman Heather Nauert said in a statement. British Foreign Secretary Boris Johnson called Russia's involvement "an egregious example of the Kremlin's disregard for innocent life" and called on Moscow to cooperate fully with the investigation. Russia denies involvement in the downing of the Malaysian Boeing 777 that was flying 33,000 feet (about 10,000 meters) over war-ravaged eastern Ukraine when it was torn apart by a Buk missile fired from territory controlled by pro-Russian rebels. Bodies, debris and burning wreckage rained out of the sky and into a field of sunflowers near the rebel-held village of Hrabove in the Donetsk region about 40 kilometers (25 miles) from the Russian border, where fighting had been raging for months. Speaking at a business forum in St. Petersburg, Russian President Vladimir Putin denied Russia was responsible for downing MH17. He said the Ukrainian military could have been responsible, noting a 2001 incident in which the Ukrainian army accidentally downed a Russian airliner over the Black Sea, killing all 78 people on board. Putin said Russia would not trust the investigation's final findings because Russia is excluded from the investigative team. "We aren't taking part in it, and our arguments haven't been accepted by the investigative commission," he said. Russian Foreign Minister Sergey Lavrov told reporters that Moscow has cooperated with the criminal probe and sent data including radar images from the day the plane was shot down. Goran Sluiter, a professor of international criminal law at the University of Amsterdam, said the legal move appears aimed at least in part at pressing Russia to cooperate with the investigation, but was not without risks. "It's getting a bit blurred because there's a state responsibility claim now interfering with a criminal investigation," Sluiter said. He said it would be tough to pursue Moscow in court. The most likely legal venue would be the Hague-based International Court of Justice, which settles disputes between nations. The United Nations' top judicial body can only rule, however, if both sides accept its jurisdiction, or if it can be established that Russia breached a treaty to which it is a party and that includes a clause sending disputes to the ICJ. Ukraine already has gone to the ICJ in a case that, among other demands, seeks compensation for the downing of MH17 from Russia. Moscow argued that the court does not have jurisdiction. Judges have not yet issued a definitive ruling but said in a preliminary decision in April 2017 that they appear to have jurisdiction based on a treaty cited by Kiev. Relatives of those killed welcomed the legal developments over the last two days as the fourth anniversary of losing their loved ones approaches. "This is great news," said Hans de Borst, who lost his daughter, Elsemiek. "I understand why the government waited, but now the evidence is clear." Silene Fredriksz-Hoogzand, whose son Bryce and his girlfriend were on board the flight, called the investigation's findings an important step forward and the decision to hold Russia responsible "two steps forward."